Chocolate Cherry Sourdough in "Modernist Bread"
The chocolate cherry sourdough bread recipe is published recently in the New York Times article, "slicing through the myths to rethink bread." The article reviews the new bread book, Modernist Bread, chronicling the history and science of the bread making in-depth. It addresses the key question: how do you make the best bread possible? Do I need another bread book? I own the Modernist Cuisine at Home and have read it from cover to cover. Furthermore, I thoroughly enjoy the deeper explanation and useful variations the "modernist" books provide. This bread book can be useful. But it is also seriously expensive ($600), there is just no way to justify it for a home baker, isn't there? Why not start baking one of its recipes? This chocolate cherry sourdough bread has earned a place on your holiday dessert table. What is different about this bread as compared to most sourdough breads I make? The use of yeast as leavener, in conjunction to the basic one-stage sourdough starter. Sourdough starter is in excess of 100% of flour weight, a large amount of sour culture where lactic-acid-producing bacteria or LAB dominates. Hydration is about 89%, considering the high percentage of 100% hydration sourdough starter used. However, the dough was quite manageable. A copious amount of cherries and chocolate chips are added at the second fold, making the bread a delectable celebration dessert/bread. High degree of gluten development is desired. A cold ferment in the refrigerator for 14 to 16 hours is an option. Or proof at about 55 degrees until the dough has increased in size. Cold dough is brought to room temperature in a cold cast-iron Dutch oven. (This reminds me of Westphalian Pumpernickel and Icelandic thermal bread that cook low and slow, in sealed pans. The slowly rising internal temperature creates the ideal conditions for the amylase enzymes to transform starches into sugars and the bread carries a slightly molasses notes.) Then bake in the 500°F oven for a total of 43 minutes. The final bread has a subtle sweetness, produced by the enzyme activity and as the sugars caramelize during baking. Meanwhile, there is no sugar at all on the ingredient list. The addition of yeast, the high percentage of sourdough starter, the cold-temperature proofing and the use of a cold Dutch oven are some of the measures bakers often use to manipulate the yeast, enzyme and LAB balance. They work wonderfully well here to create the complex flavor profile of this bread. This recipe is reminding me what I've read in the bread-baking books and the true notion that "baking is biochemistry." Indeed! Your pictures and writeup have me interested. The bread looks wonderful. Beyond the standard FWS I'm usually disinterested in putting most things into the dough. But if this bakes up as much a cake as a bread, I'll have to visit this soon. there is not a huge departure from the usual process in mixing, fermentation, shaping and the rest. The process is quite similar to that of FWS or Tartine. 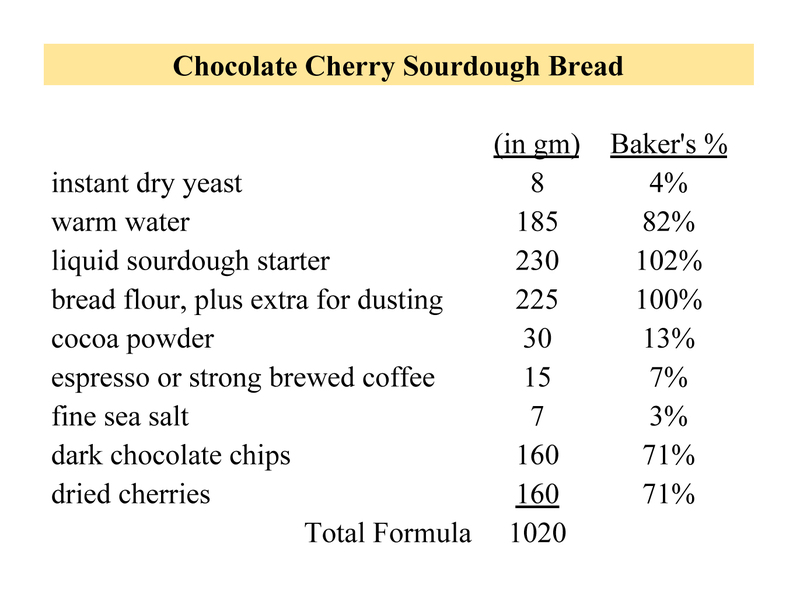 It's the biochemistry behind the process that makes the chocolate cherry sourdough bread unique. As I see it, the differences are primarily: 1) the amount of sourdough starter, 2) low-temperature proofing and 3) the cold Dutch oven, without preheating, to allow a slow rise in temperature in the oven. That produces a cake/bread hybrid with a satisfying sweet note. I tasted a similar bread at Blue Hill at Stone Barns. They serve it for dessert and left a huge impression on me; I would do the same with this bread. Perfect for the holidays. According to the recipe, there is a total of six series of stretch and fold, one every half hour. Test for the dough to stretch out to a thin membrane. (I forgot to do that.) Dried cherries are called for, no soaking is required. I'd cut the cherries in smaller pieces instead of leaving them whole. On the other hand, the cross-section look at a whole cherry on a slice of bread is very appealing. Happy baking! Let me know how it turns out. We were up in NY for a wedding in Piermont last month. Drove right by Stone Barns on our afternoon "off" on the way to Sleepy Hollow from the Chagall church. My brother in law and wife have dined at the Blue Hill in Greenwich Village & Stone Barns at least once each or more as they live just north of Washington Arch. Drat, now I'll have to fish my Dutch Oven and banneton out of the cobwebs. OTOH, I may just shape a big batard and jury-rig the whole affair another way. Hmm. Anyway, it'll have to get to the end of the queue of a few other bakes lined up before that. set up at Stone Barns is as impressive as its kitchen, in the opinion of an obsessed baker. That, the green-house-to table taster menu, and the village church filed with Chagall is tough to top. May be that's why I connect to this deep dark chocolate cake-like bread. I actually took another stab at building a starter and reanimating my prior try that had been left to starve in my fridge for years because of this recipe. Ironically, I have done other breads but not this one. Do you think it can be held more than a day in the fridge before baking without issue? relates to the starter or the fermented dough. The fermented dough can certainly cold retard for 14 to 16 hours before baking, then bring it to room temperature in the cold Dutch oven for 1 to 2 hours. this looks amazing. But does it have the mouthfeel of bread or cake?? And does it taste very sweet?? The baking process is definitely bread; so I'll call it a bread. There is enough gluten structure in there, unlike most cakes. So the mouthfeel is more bread than cake. But it is sweet enough that you can get away serving it for dessert. (They did just that at Blue Hill at Stone Barns with extraordinary results. All the diners were raving about it as I was. ) The sweetness is not overwhelming, just a hint of it. If you are concerned about sugar consumption, this is an unusual treat. This bread is in a special niche all its own. Hope this helps! If I understand right, the "liquid" sourdough starter is 100% hydration??? That's exactly right, 100% hydration starter.